The Elder Scrolls: Blades is an upcoming free-to-play spin-off of the Elder Scrolls franchise. It will feature procedurally generated dungeons similar to Arena, rebuilding a destroyed town, and PvP combat in an arena. Originally planned to be released in Fall of 2018, the game is set to release in early 2019, and will be released on portable devices, current generation consoles, PC, and be available to play in VR (it is not confirmed as free-to-play for consoles or PC). In Blades, "you are a member of the ancient order of the Blades. Forced into exile, you seek refuge in your remote hometown only to find it reduced to rubble. Now, it's up to you to restore your town back to its former glory". Blades will feature cross-platform multiplayer modes, where players can battle against each other. While still under construction, you can sign up now for beta testing when it becomes available. Just visit PlayBlades.com. Beta testers will receive an exclusive sword and helmet. 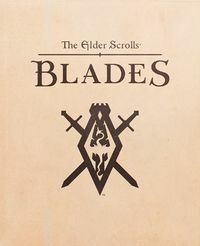 Blades will feature many of the hallmarks of the Elder Scrolls games. You will have access to powerful magic, many types of weapons and armor, as well as skills. Battles will also take place in real-time, and will rely on touchscreen, rather than buttons. You will need to build your town, and can customize it in many ways. You will need tools and materials to do this, which you can get by dungeon-delving. There will also be an Abyss mode, which features a bottomless dungeon. Survive as long as you can so you can prove yourself worthy of the Blades. Blades will have the option to play either two-handed or one-handed on your device, with the option to switch between the two by simply rotating your device. As a spin-off and to suit mobile devices, Blades will feature only a small fixed world. Dungeons will be generated in a similar manner to Arena, which were generated from a small number of "cells" selected in a random order. The game is scheduled for release in early 2019. It is currently under development and has not yet reached beta testing. System Requirements — The official minimum and recommended system requirements for the game. This page was last modified on 2 March 2019, at 21:29.